Rhododendron minus var Chapmanii. Chapman's Rhododendron. Rare evergreen rhododendron native to Northern Florida. Believed by some to be the most rare wild rhododendron in North America. Rose pink flowers in Spring are exquisite and borne in clusters. 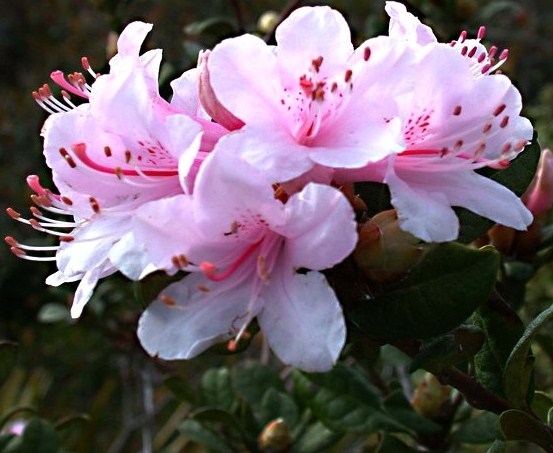 Chapman's Rhododendron occurs naturally only in Florida, but can be grown in USDA Zones 5b - 8. The only evergreen rhododendron native to Florida. Chapman's Azalea belongs in every woodland garden. Site: Prefers filtered sun beneath pines or hardwoods. Moisture: Likes regular water but not soggy soil. Mature Size: Varies. Can be anywhere from 4 feet tall to 10 feet tall, depending on site, soil, and conditions. Size Shipped: Gallon Shrub shipped without pot. Price includes delivery by Priority Mail. **Not collected from the wild - our shrubs are all nursery propagated.